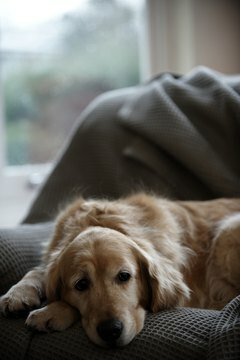 Ear mites can make your golden miserable. Problems such as ear infections and ear mites are common in golden retrievers. Their large floppy ears are literally a breeding ground for problems. Symptoms of ear mites include excessive scratching of ears, head-shaking, strong odor and a discharge with the appearance of coffee grounds. Mix equal amounts of white vinegar and warm water. Dip a clean cotton ball or cloth in the solution and gently wipe the inside of the ears down. Do not stick anything into the ear canal while cleaning. Continue wiping until the skin is free of any discharge and dirt. Dry the insides of the ears carefully with a dry cloth. Use your palm against the exterior of the dog's ear flap to wipe the inside with solution and to dry. Place a bottle of mineral oil in a pan of hot water and leave it in until the oil is warmed slightly. With an eye dropper, place five drops of oil in each ear canal. Massage each ear so that the oil is worked well into the canal. Leave the oil in the ears for two hours. Wipe each ear out with a dry cotton ball to remove any excess oil. Repeat the cleaning and the oil treatment twice a week for at least three weeks, even if symptoms disappear rapidly. If the oil treatment does not bring about an improvement of symptoms, take your dog to the veterinarian. A veterinarian will commonly prescribe an anti-mite medication and possibly an antibiotic and anti-inflammatory medication.